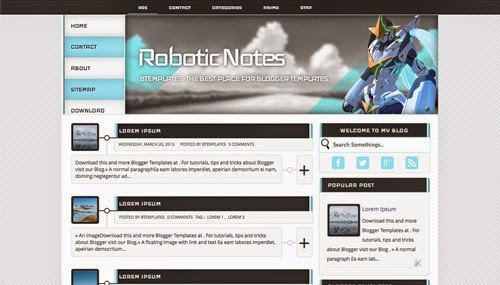 Robotic Notes Free Premium Blogger Template ini terdiri dari 2 columns, right sidebar, fresh look, rounded corners, exclusive design for Blogger, footer columns, social bookmarking icons, posts thumbnails, drop down menu, related posts, a background pattern, related posts support dan well formatted threaded comments. Template ini sangat cocok untuk anime, computers, entertainment, games, internet, kids atau science. Tertarik? Silahkan download disini Gratis.. ! !